Banking has never been more convenient! Find a friendly Credit Union Shared Branch near you! Learn what services are available at a shared branch. Download Shared Branch info to your GPS device. Credit Unions: See our Resources section for important news, documents/forms and much more! The Credit Union Service Company of Virginia, LLC was formed in 1993 to address credit unions' need for additional physical branches. By pooling their resources, credit unions are able to share, lease, and in some cases build, service facilities in high-traffic areas, which otherwise would be cost-prohibitive for an individual credit union. • Your Credit Union and others are joining together and are sharing their branches so you can conduct financial transactions where you live, work or travel. • More than 1,744 credit unions nationwide have access to 5,069 shared branches in all 50 states, Washington, D.C., various territories, and a number of overseas locations. For comparison, only three major U.S. banks boast a greater number of branch locations - Wells Fargo (6,337), JPMorgan Chase (5,695) and Bank of America (5,601). • Shared Branches are linked with your credit union electronically, giving you access to your credit union accounts directly through the shared branches or its ATMs. 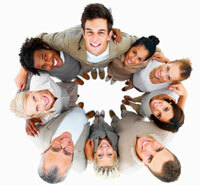 There is no better way to extend your credit union's reach than through participation in the shared branching network. Your members instantly gain access to a network of branch locations with which even the largest banks can't compete.